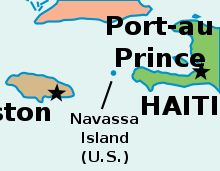 Navassa Island is a small, uninhabited island of ► Haiti located in the Caribbean Sea east of ► Jamaica and south of Guantanamo Bay, ► Cuba, that is also claimed as an unorganized unincorporated territory of the ► United States, which administers it through the U.S. Fish and Wildlife Service. Haiti, has claimed sovereignty over Navassa since 1801, and claims the island in its constitution. In French it is named La Navasse and in Haitian Creole it is named Lanavaz or Lavash. Status ► Haiti, claims the island, Haitian since 1801. ► United States outlying island, American since 1857. More images Navassa Island - Navassa Island (Category). This section holds a short summary of the history of the area of present-day Navassa Island, illustrated with maps, including historical maps of former countries and empires that included present-day Navassa Island. In 1504, Christopher Columbus, stranded on Jamaica during his fourth voyage, sent some crew members by canoe to Hispaniola for help. They ran into the island on the way, but it had no water. They called it Navaza (from "nava-" meaning plain, or field), and it was avoided by mariners for the next 350 years. Despite an earlier claim by Haiti, Navassa Island was claimed for the United States on September 19, 1857, by Peter Duncan, an American sea captain, under the Guano Islands Act of August 18, 1856: for the rich guano deposits found on the island, and for not being within the lawful jurisdiction of any other government, nor occupied by another government's citizens. Haiti protested the annexation, but on July 7, 1858 U.S. President James Buchanan issued an Executive Order upholding the American claim, which also called for military action to enforce it. Navassa Island has since been maintained by the United States as an unincorporated territory (according to the Insular Cases). ↑ Serge Bellegarde (October 1998). Navassa Island: Haiti and the U.S. – A Matter of History and Geography. windowsonhaiti.com. Retrieved on February 6, 2008. ↑ Haiti: Constitution, 1987 (English translation). ↑ GAO/OGC-98-5 - U.S. Insular Areas: Application of the U.S. Constitution. U.S. Government Printing Office (November 7, 1997). Retrieved on March 23, 2013.